If you've been socially aware for any of the Christmases of the past 30 years, you may well have encountered Raymond Briggs's televisual treat The Snowman. Accompanied by the dulcet tones of a young Aled Jones, The Snowman, for a lot of us, is a Christmas rite of passage. Styling his way on to the small screen this Christmas Eve, Briggs's iconic snowman is back and he's not alone. The sequel, based on the characters of Raymond Briggs, The Snowman and the Snowdog is showing at 8pm on 24 December 2012 on Channel 4. And in true 2012 style, there's an app for that. 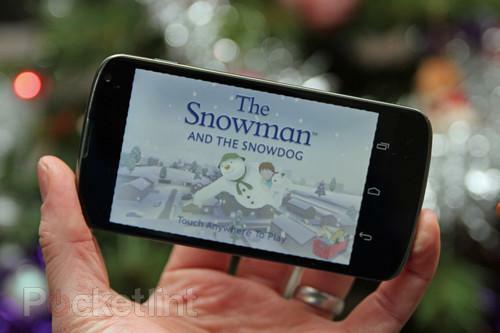 The Snowman and the Snowdog game sees you take flight with the characters, looking to collect various items as you pass through the levels of the game, before making your flight to the North Pole. There was once a time when we'd dismiss a spin-off game out of hand, but the familiar smile of the Snowman and his companions instantly appealed to us. This may be a simple game designed to promote the airing of the programme on the TV, but we're willing to overlook that. The premise of the game is simple. You fly through various parts of the country, tapping the screen to collect things as you go. The only real decision you have to make is whether you stick with a level or head off somewhere else. There isn't much to challenge you, but that's not the point - this is really a game for children. Realising as much, we put The Snowman and the Snowdog into the hands of Miss Pocket-lint (6-years-old, just), who happily whiled away half an hour collecting snowflakes, ice creams and puzzle pieces while flying through the levels. There's a list of achievements, so you can see what there is left to collect, but cleverly the puzzle pieces go forward to make up scenes from the forthcoming programme, so there is something of a hook to get you anticipating the programme. The simplicity and cuteness of the game is perfectly pitched for children; those familiar with the earlier show's animation will enjoy this effortlessly cute distraction. For adults there's the great nostalgic feel, perfect for slipping into your favourite comfy chair to escape from the stresses of Christmas for 10 minutes, perhaps while sipping some of that special Christmas sherry. Ultimately there's no culmination to the game and you basically do the same thing across the five different levels offered, but this is a free promotional game and we enjoyed it anyway. Perhaps the only thing we don't like is that at one point you fly past an in-game billboard advert for The Snowman and the Snowdog on Channel 4. Sure, the aim of the game is to get people watching, put it does pop the bubble a little. A quick game for youngsters or lovers of The Snowman, it won't change the world, but it's super cute, and might buy you enough time to finish making those stuffing balls.